FAR Products, Inc. designs and builds castings processing systems for ferrous and non-ferrous applications. Our products include trim presses, leak testers, saws and mills, core removal equipment, and mold handling systems. 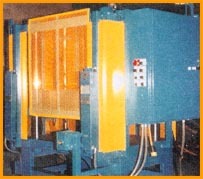 All machinery is designed to meet the needs of the of the particular application. All machinery is designed, built, wired, plumbed, and final tested in house. This allows you, the customer, a one source location for custom machinery. The photos below are typical examples.